Fukushima Collective Evacuation Trial is a "scientific trial", which emphasizes an importance of facts whether it is dangerous or not. If it is dangerous, avoid it; this is the principle of a scientific trial. Today, the Sendai High Court clearly states that plaintiffs live in Koriyama city have been exposed by low-level radiation, and the long-term exposure is concerned damages of their lives, bodies and health in comparison to damages brought among children after Chernobyl disaster, which means children and people in Koriyama city might have grave consequences for their lives, bodies and health. This is an epoch-making finding of fact, which should definitely conclude with judgment for saving children from danger. However the Court didn't do so. Nevertheless children in Koriyama city are in danger, be still. How such an acrobatic conclusion come? The extreme logic is based on an idea "Ones who think it danger evacuate voluntary. Take your own risks, there's no need to do anything for the city and the government." No way, it's turning things upside down!! Victimizers, the government who brought the nuclear disaster and a municipality, Koriyama city who has constitutional duty to educate children in a safe environment should take risks. Essentially, children who are innocent and 100% victimized by the nuclear disaster have nothing to absorb. Has there ever be judgments worse than this delusive and brutal one that dismissed a claim to save children in danger turning things upside-down with extreme logic? This conclusion cannot be accepted. We have to straighten this wrong judgment with our hands, I think this is the way of responsibility for children. From now on, raise your voice again and again!! I received the conclusion of the Sendai High Court. As I've been saying that I won't trust in any trials, the conclusion heightened my feeling. Nonetheless the judgment acknowledges a danger of low-level radiation exposure, it says no immediate risk on health. In addition, it concludes the only solution is to evacuate or relocate; changing schools is not enough to avoid radiation exposure over 1mSv/y. Yes, that point of the conclusion is absolutely right. In order to avoid radiation exposure over 1mSv/y, there's no other way to evacuate from contaminated areas including Koriyama city. The government has responsibility to do so, and I've been insisting so. In spite of that, the judgment dismisses a claim of plaintiffs saying they may be able to evacuate or relocate anywhere if they want safer environment below 1mSv/y. The problem is clear that the government is responsible for this forcible radiation exposure toward children; people in contaminated areas are not responsible for. The Court which cannot recognize this point is very much like a slave of nation. Sendai High Court dismissed a claim of plaintiffs, nevertheless they recognize that it would be concerned a serious matter on lives, bodies and health of children because of the Fukushima nuclear disaster. Even if children changed routes to schools, they stay in contaminated areas for the last two-third time of daily lives. However, the conclusion acknowledges a danger in another respect, so I think it can be a foundation of our new movement which demands a collective evacuation from the middle area of Fukushima Pref. including Koriyama city. Let's keep on struggling to save children's and people's lives and health. Be the conclusion our "weapon", that evidences radioactive contamination brings a serious matter. There has been considerable outrage from Japanese netizens on Twitter as news breaks that Amano Mari, the Japanese government representative for the Conference on Disarmament, fails to sign a joint statement by 74 nations prior to a review of the Non-Proliferation Treaty in Geneva, Switzerland. The statement asked representatives to commit to not using nuclear weapons under any circumstances, but Amano said that this conflicted with Japanese security policy. As a nation that has the suffering of both the atomic bomb and nuclear disasters still in living memory, Japanese netizens took to Twitter to make their feelings known. When some 50 protesters gathered outside the Japanese Mission to the Conference on Disarmament in Geneva yesterday, questioning that country’s refusal to sign onto a joint statement on the humanitarian consequences of nuclear weapons submitted to the NPT PrepCom by 74 other non-nuclear-weapon states, Ambassador Mari Amano felt obliged to give an answer. Why, after all, would the only country ever to have felt the full effects of atomic bombings find it difficult to condemn their existence on humanitarian grounds and join an appeal for their total elimination? So here’s what this means: By entering into an agreement with a nuclear-armed state that its weapons are, in effect, yours by proxy, and that they can be used on your behalf (in fact, you expect that to be so), you lose not only your moral standing to condemn nuclear weapons along with most of the rest of the world, but also your political capacity to join others in an unfolding process that could lead to their abolition. In other words, you become unable to provide for your own and everyone else’s security in the most meaningful way possible, while leaving your people vulnerable to annihilation by weapons you neither possess nor control. Sweet deal! For countries such as Australia and the Republic of Korea, which also live under the threat of extended deterrence and also declined to sign the joint statement, this simply illustrates the corrupting nature of nuclear politics. For Japan—the embodiment of all that is inhumane about nuclear weapons, the one country universally invoked as the moral center of the abolition movement, the home of the Hibakusha—the decision not to sign is tragic and inexcusable. The program started in 2000, conducting a 10 year study on 5 provinces of the Ukraine – measuring and monitoring all newborn babies. The study, led by Dr Wertelecki, was done in co-operation with Ukraine health authorities. This was a descriptive epidemiological study. It could prove only a difference between geographical areas. It cannot prove the cause of difference. Within 2-3 years it was obvious that the rates of spina bifida and other defects of the nervous system, were many times greater than expected, particularly in one province. A few years later an excess of conjoined twins (“Siamese twins”) was found. They found other nervous system problems, mainly microcephaly (tiny head) .. After 10 years of study they published a report showing an excess of frequency of anomalies of nervous system and of these conjoined twins. This was found especially in the northern half of the province – an area that is a unique ecology niche – mainly wetlands. And this area also has a unique population, an ethnic group living there since recorded history. They live in small villages, very isolated, and they rely completely on local foods. These foods are all radioactive. The soil there is such that plants absorb many times more radioactivity. People there are absorbing much higher levels of radiation. – 20 times more than there would be in soil 50 km. away. Dr Wertelecki reminds us that there are many causes of birth abnormalities. One well recognised cause is foetal alcohol syndrome, due to alcoholism in the mother. However, the program did in fact research this question. 6 universities joined it in a very well funded and thorough study of pregnant women. It showed that in this Northern area, alcohol use among pregnant women is statistically less than in the Ukraine in general. . Alcohol does not explain the birth abnormalities. Radiation is the obvious major cause. Little research has been done on the causes of this in humans. Studies on non human species show that foetuses in first three months are about 1000 times more vulnerable to environmental effects. Dr Wertelecki’s team focused on teratogenesis – changes caused by environmental interference to a developing foetus, a foetus with with normal genes. This must be distinguished from gene mutations, inherited from parents and the two processes have different effects. The genetic, inherited defects are most likely to cause mental disability. But with the teratogenic abnormalities, the baby, if it survives, most often is of normal intelligence. This process can begin very early, before the ovum has been implanted in the wall of the womb – before the woman knows that she is pregnant. That very early “line” of the embryo can split. In this case – the result is – twins. This split can be incomplete – resulting in conjoined twins, (“Siamese twins”). A fetiform teratoma is a sort of failed Siamese twin, a monster like mass, containing a mixture of tissues. KIEV, April 23 — Ukraine will cover the collapsed roof of the Chernobyl nuclear power plant with special resin to prevent the spread of radioactive dust, a senior nuclear safety official said here Tuesday. “As soon as the weather permits, we will cover the equipment under the caved-in parts of the roof with special resin,” Mikhail Gashev, Ukraine’s chief inspector of nuclear and radiation safety, told reporters. 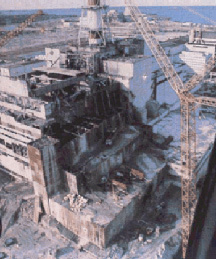 Spraying synthetic resin over the inactive plant’s equipment was routine procedure, Gashev said, adding that similar work was carried out annually throughout Chernobyl. This year, Ukraine would spend 1.5 million U.S. dollars, up from 1.25 million dollars in 2012, to bolster nuclear safety at the plant, Gashev said. About 600 square meters of the roof at Chernobyl, where an explosion and reactor meltdown occurred in 1986, collapsed in mid-February. Authorities said at the time that the collapse posed no threat to human health. USA raises “permissable” radiation level. Why?